A couple of months ago I blogged about how I desperately wanted a pair of Tiek Flats and how I thought they were just about the coolest thing since golden oreos (I don’t like chocolate). Well, being the amazing family company they are, they were so generous and offered me a discount in response to my blog! There was no way I was going to pass up that offer. The next thing I knew, I was waiting like a little kid on Christmas morning for my hot pink Tieks to arrive. I wasn't disappointed. The perfect blue box topped with a flower just heightened the excitement! There’s something about shoes that never get old. Cinderella is first hand proof. Well the shoe fit! They are like walking on clouds every time I take a step; goodbye blisters! I throw them in my purse and they are coming in handy even more now that I’m in the city for my internship! They are paired perfectly with any outfit, but in the event you need to wear heels then do as I do and change when you leave the office so you don’t have to worry about strutting the NYC streets in uncomfortable shoes. They are just so stinking cute and the bright blue sole never fails to make me smile. Per school rules, I was required to wear heels for my ceremony, but after graduation I knew I would be super busy and there way no chance I was going to make my feet suffer for the rest of the day! 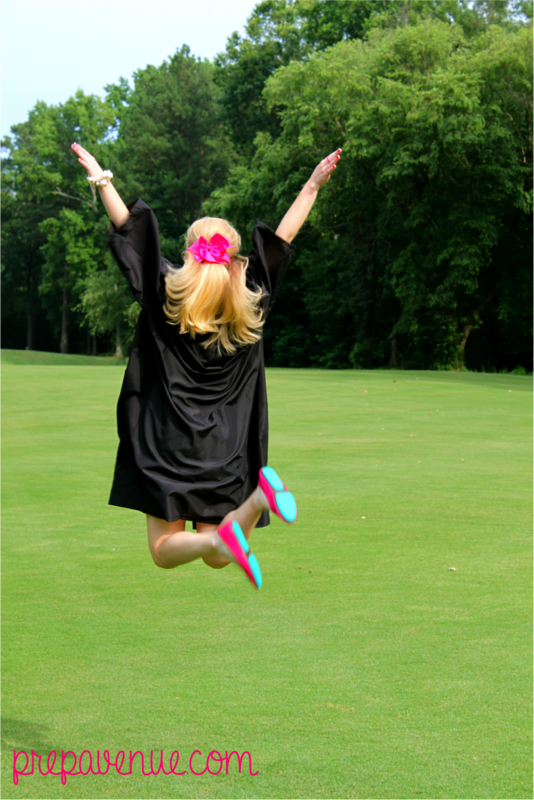 I took this picture on graduation day and I think it just exemplifies the pure greatness of the shoe. Thank you again Tieks, I truly love every second I spend in your fabulous shoes. Check out my other post about Tieks!